What’s this all about? And what do we think about it? There’s so many new hair care trends doing the rounds nowadays, that it’s difficult to keep track of them. But how do you weed out the good ones from the bad? Well, Hairsutra has done a fair bit of research to find out which ones really work and which ones you can leave behind. Today, we tackle the Pre-poo trend that’s been creating ripples in hair care around the world. Turns out, your shampoo routine is actually quite a stressful experience for your hair. Shampoo cleans your scalp up any dirt and grime, but the sulfates and parabens also strip your hair of its natural oils, or sebum [we discussed sebum, remember?]. And it doesn’t stop there. With every wash, your hair shaft expands to accommodate the extra volume. Then, when your hair is drying, it contracts. The expansion and contraction of hair fiber is called hygral fatigue, and a repetitive pattern of this is bound to do a significant amount of damage to your hair cuticle. You’ll see these with the symptoms of breakage, roughness, frizz, choppy, split ends. Naturally, you can’t do away with washing. Just think of what your mother will say when you suggest it to her. To reach a middle ground, we think it’s a good idea to give your hair a shield before it goes into the washing battlefield. Here’s where the term ‘pre-poo’ comes in. It’s the treatment you give your hair before a shampoo. 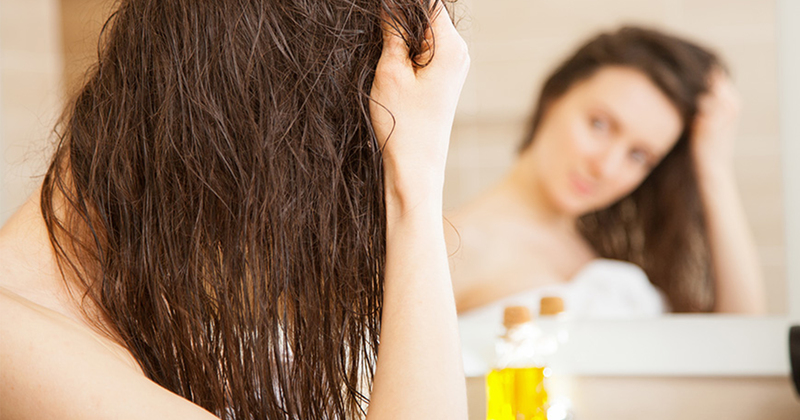 Hair oils, masks and packs that condition your hair before a shower, are all methods of ‘Pre-poo’. 1. I want my hair to be nourished and strong. There’s nothing like a pre-poo to seal in the moisture – its rich oils and conditioning ingredients penetrating the shaft and hydrating it from within. No constant contraction and expansion of hair means healthy, stable hair. 2. I want to protect my scalp from chemicals. A pre-poo prepares your hair for a shampoo – creating a soft coating that no sulfate can penetrate. The result- no loss of natural hair oils!. 3. I don’t want to lose my hair to breakage. As we all know, just-washed hair is prone to breakage. Pre-poo shielding allows hair to glide past each other easily, making detangling easier – and your hair smoother! 4. I don’t want to use my condtioner. Whether you have oily hair or not – most of us are prone to vigorous post-shampoo conditioning. Pre-poo will keep your hair from getting limp post conditioning. And if you like, you can skip the conditioning process altogether. 5. I want to style my hair. Once you’ve pre-poo’ed, your hair falls easily. It ensures your hair gets the right amounts of moisture - frizz, dryness and coils are kept at bay. This makes your hair easier and more fun to style. Plus, your hair gets additional protection from any heat damage. While oiling before washing has been the quintessential Indian hair care routine, many women give the pre-poo a miss owing to their busy schedules and lack of time. Turns out though, that we aren’t accounting for all the damage hair washing could be causing. The Pre-poo is an an easy-to-do solution for counter-acting the adverse effects of your shampoo. It will give it the nourishment and care it needs before you hit the shower. We give it a thumbs up all the way! Your hair suffers from hygral fatigue and dryness from harsh chemicals, everytime you shampoo. While the world is just waking up to this hair care trend, the quintessential Indian hair care routine of oiling before a wash has been a timeless solution for counter-acting the damage from shampoo.